Picking up right where they left off from the season ending cliffhanger of Season 12, the gang is in hot pursuit to rescue DB's granddaughter. This was a good, if a bit predictable episode. The only thing that really came as a shock was when Jack Gilmore (Craig Sheffer) gets popped inside the car with DB and Nick with their guns drawn on him. I thought it was another Pulp Fiction moment. It's painfully obvious right out of the gate who will be revealed to be the gunman of the Dinner. But in spit of this, I thought the episode was pretty good. Very entertaining and the path to get to the end wasn't a complete waste. Now THAT was a riveting episode from start to finish. Pretty sick too. Even though the character was fictional, I felt very bad for the victim. I thought the scene with the victim and Finn packed an emotional wallop that you just don't see on CSI all that much and certainly not on most other shows. Kinda cool episode that was basically anchored by the music of Frank Sinatra and the clue used to solve the case was a Vinyl pressing of a rare Sinatra album. I think the episode could have been a bit more deeper. They are asking the viewer to invest in Greg's connection with the victim. Had they set up some sort of relationship, at least in flashbacks, it would have resonated more. 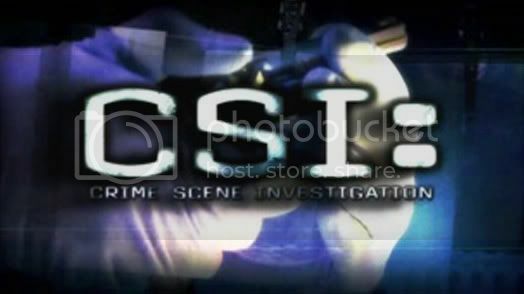 CSI is 13 years old and I'm shocked that they are just now getting around to doing a episode focused on the K-9 Unit, or more specifically Sam The Dog, who is a witness to the murder of his Partner. The scenes with Sam were awesome. By the end of the episode I was telling myself they should make him a regular on the show. Well, they set it up that Nick would be taking Sam home and caring for him and living with him from here on out. Not sure if we will see a lot more of him though, other than when they show Nick at home. When you see that Michael Gross is the guest star and has a tiny part at the beginning of the show and then disappears for the bulk of the episode, it's pretty obvious who the killer is gonna turn out to be. The only good twist here is who Charlie's girlfriend Vanessa turns out to be. I knew something was rotten in Denmark with her. This episode had an energy to it that hasn't been around for a long time. With the story being anchored by Warrick Brown and his son, it just felt different. Brings back memories of when CSI use to be 'must-see TV'. It's also a reminder of how far off the cliff the series has gone since killing off Warrick [/b and the departure of Grissom, Sara (she left, but returned a year later) and Catherine. I miss those days and those characters in particular.